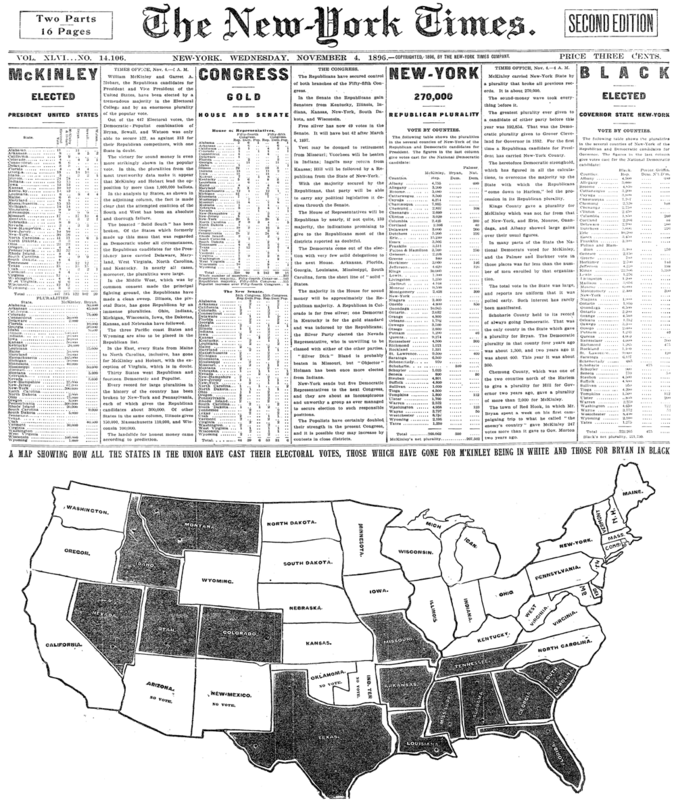 The map occupied about half the front page — which also had an impressive amount of election results tables intermingled with the stories above. The speed with which the results made it into print boggles the mind given the technology of the day (especially considering that in the last few elections in the 2000s, with all of the technology available to us, there have been a number of states that we haven’t been able to call in the Wednesday paper). 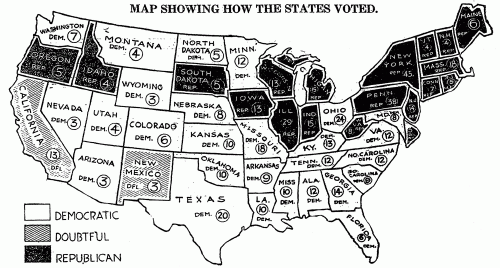 Over the next few elections, the maps grew more sophisticated. 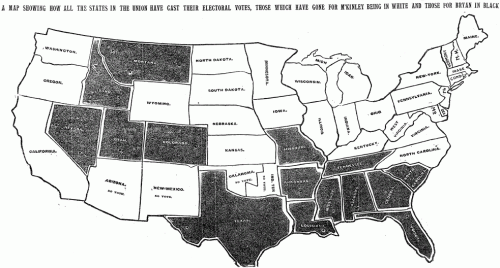 In 1904, we have hatching, an actual map key, a much less crude rendition of the U.S., and labels on the map with the number of electoral votes for each state. And 1916 marks the first appearance on the map of one of my favorite terms of the era: the “doubtful” states —those for which not enough results were in to call a winner — in this case, California and New Mexico with their 16 electoral votes. They’re obviously a far cry from the interactive, updated-by-the-minute maps we publish today, but incredibly impressive for the era. It makes me wonder if the artists who produced those first maps had the same thrill at seeing the results in the next day’s newspaper that we now get from having interactive maps online and updating on election night. These are great; thanks for digging them up! The exaggerated northeastern states in the 1916 map excited me briefly because my first thought was “cartogram” (this being in the very early days of cartograms). Alas it’s not that, but it’s still pretty interesting. It went from “less crude” in 1904 to deliberately simplified in 1916. Do you notice what almost all of them have in common? 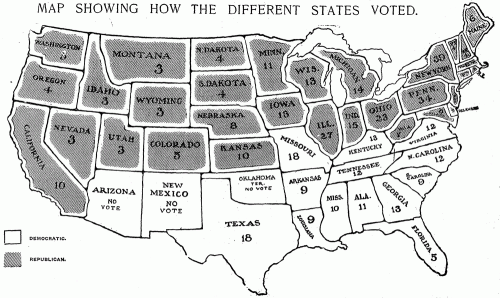 The south votes one way, and the rest of the country votes the other. 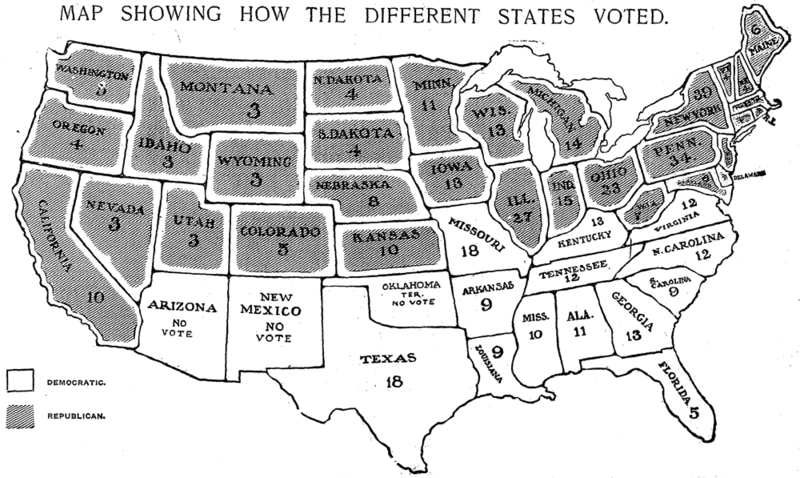 The names of the parties have switched in modern times (1932-1968 being the period where the switch took place), but otherwise we are still fighting the war between the two “nations” welded together in 1788/1789. It seems like this is a early morning edition. In the first column of the copy, it says “Times Office, Nov. 4.—1(?) A. M.” I’m not sure what the last number is precisely, but it’s incredible how quickly the paper was ready! Great post! Thanks for sharing this research in the archives. For me it gives a nice insight on historical perspective of all sophisticated tools we got nowadays. No new ideas behind cool stuff like Google maps, only way tools to create the ideas. for barth, i noticed this too, though there are waxes and wains for the border. Matthew Ericson is the deputy graphics director at The New York Times, where he helps oversee a department of journalists, artists and programmers who produce the interactive information graphics for nytimes.com, as well as all the graphics for the print newspaper.